So are you going to post that date and have an open house so we can see and HEAR that??? There is NO doubt in my mind what they make. Watching them make it on the dyno is just pretty cool. My Boat: A boat?....What boat??? How about a galvarnized warsh tub wit a toranady strapped own da rear! You are correct, I was in Bolton. I only ended up there because after 3 Months of phone calls atleast 50 of them,That was my only option. I mean I could not find a single place to launch without a hassle and I have not even begun to talk about the lack of or Zero transient slips. It was just the biggest hassle I have ever had going boating. I have boated in all of the great lakes and from Ny to Fl. I have been in the Bahamas and keys all on my own boat. I have always respected boaters. In general we are some of the best people in the world especially when it comes to helping each other. The Lake George attitude was something I have never seen in the boating community anywhere in this country and beyond. WOW...read this whole 12 page thread so far! Never been there, but looks and sounds like Lake George is a beautiful place,...hey, we have some restrictions here too, but after reading all the posts from you and others, it is hard to fathom the heavy restrictions there at Lake George. I mean, I think they would have me pegged 50 miles outside of town ---hey, just kiddin' gang! Anyway, Cocktails, and some of you other guys that are looking for nice places to do some boating...COME TO MICHIGAN! , but if you have never been to TORCH LAKE (rated at something like the 3rd most beautiful lake in the world by National Geographic Magazine). The crystal clear blue water you can see something like 20+' down. The lake is very deep, sandy bottom and roughly 18 miles long and about 2.5-3miles wide or so. 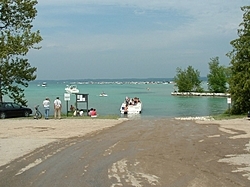 It is located only minutes away from Grand Traverse Bay...another gorgeous boating spot with awesom clear water! Go to the Great Lakes, Canada forum within OSO and/or do a search of TORCH LAKE. You can do a little research for launching ramps or read the threads in the forum. There is a thread running there now. Torch Lake has a spot there called the "SAND BAR" where hundreds of boats will anchor or beach there boat...and it is like GOD's country up there---you'll think you're in another world. It can get quite busy around there, but I am sure you will have a much better experience than the nightmare you have described above. As long as you're a COOL PLAYER I have found that you most likely will not have any problems with the law. Rev your engines un-neccessarily in a harbor or marina area, or go too fast near anchored boats or high traffic area and you're most likely going to get some attention from the law you're probably NOT going to like.